Can I still have a home security system even if I don’t have a landline? Have you been considering a home security system, but think that you can’t have one due to the fact that you don’t have home phone service? No landline, No problem – In today’s world many people do not have traditional landlines in their homes preferring instead to use only cellular telephones. ESS has a security system that incorporates cellular technology to contact the monitoring service if your system goes into alarm. This technology operates on a different band than your personal cellphone and is very reliable. It can also be used as a backup to your landline. 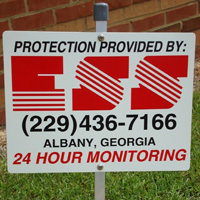 ESS is a locally licensed and insured company that has served South Georgia since 1987. Our professional and courteous staff will always arrive in uniform and in a company van. Let ESS give you the peace of mind you deserve. Call us today to find out more about the different security options available at affordable prices or click the button below to request more information.